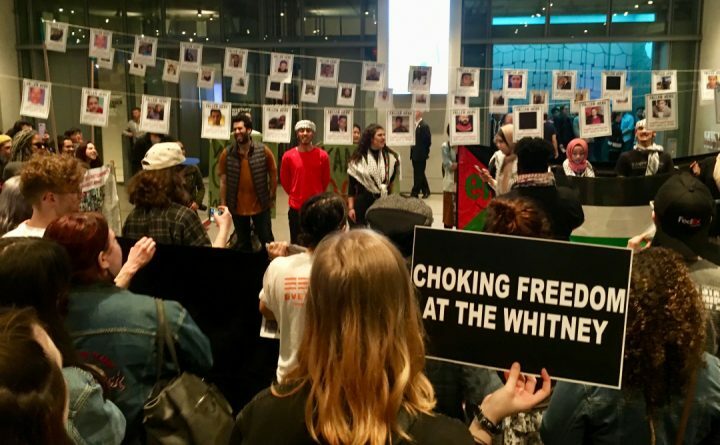 The activist organization, which demands the removal of Whitney vice chairman Warren Kanders from the board, gathered at the museum to protest alongside activists from the 30 groups that have come out to support its mission. Seven police cars sat across from The Whitney Museum on Gansevoort Street this Friday night, March 22. 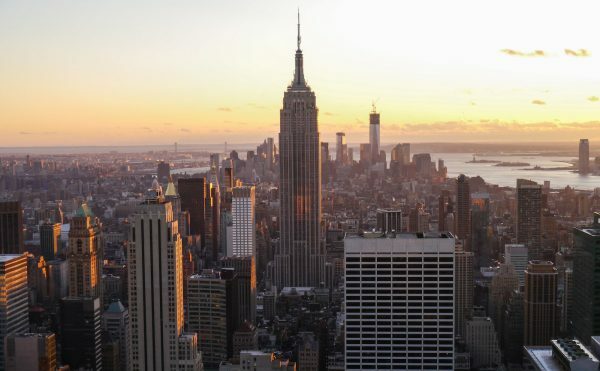 The museum regularly draws lines down the block for their Free Fridays, but it likely wasn’t the prospect of free admission to the Andy Warhol exhibit, From A to B and Back Again, that attracted law enforcement. 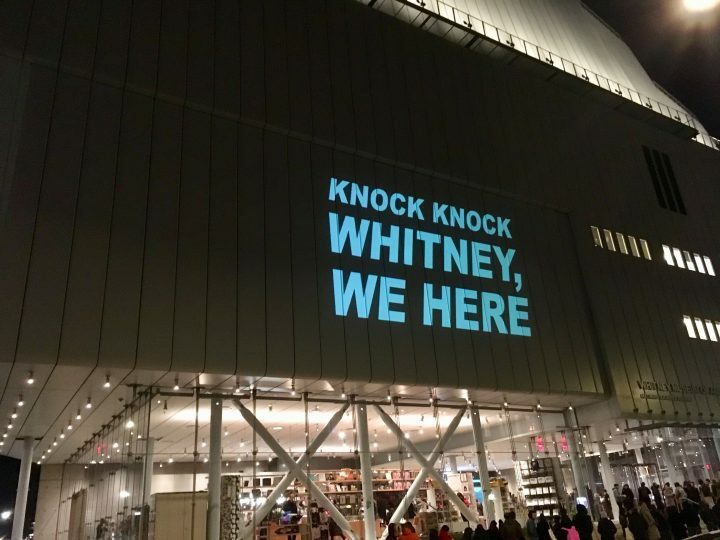 On this chilly night, activist group Decolonize This Place arrived to kick off its Nine Weeks of Art and Action, the first in a weekly series of protests leading up to the 2019 Whitney Biennial. 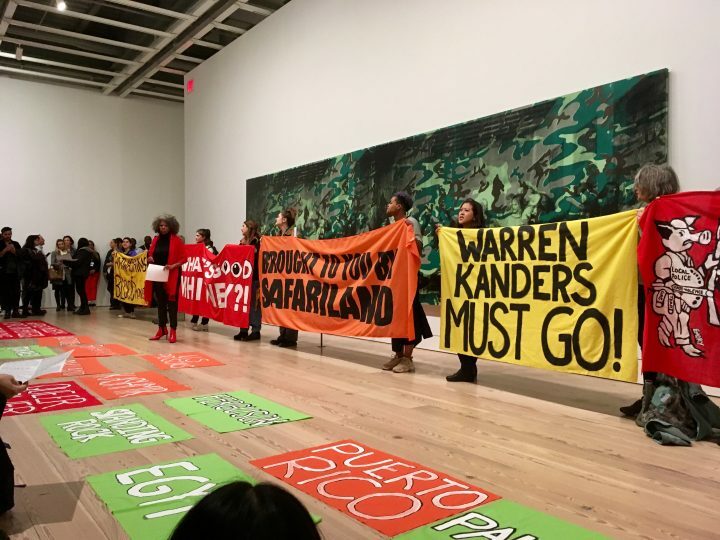 Protesters are demanding that the museum remove Warren B. Kanders, vice chairman of the Whitney board of directors and the owner of Safariland, a defense weapons manufacturer which produces tear gas that has been used on people crossing the US-Mexico border, from the board. Rodriguez served as the MC for the demonstration, which featured speakers from the 30 artistic and social justice groups joining Decolonize This Place. 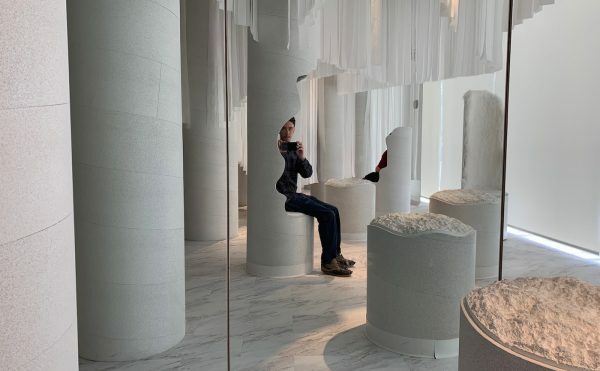 Some of the groups are directly related to the arts, like Art Space Sanctuary and Chinatown Art Brigade. Carpeting the floor in front of her were smaller banners emblazoned with the names of cities and countries impacted by racism and colonialism: Kashmir, Ferguson, and Puerto Rico, among others. 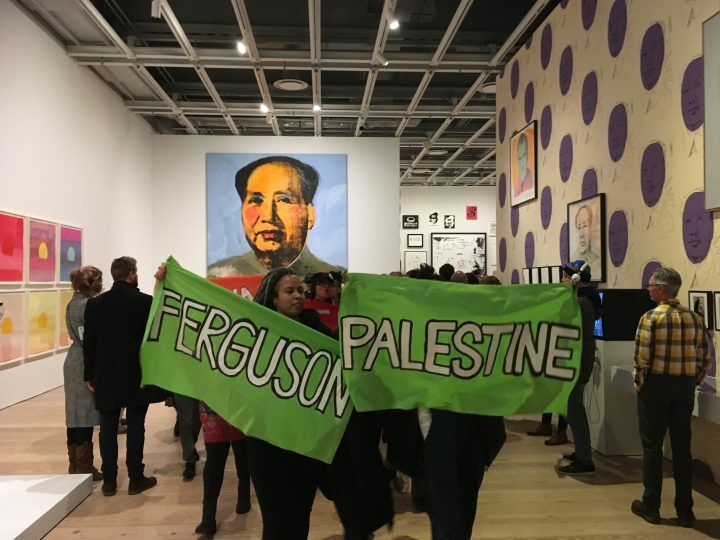 Protesters and the onlookers filled the Warhol exhibition to see the action. They cheered as Megan Kapler of PAIN Sackler (a group founded by photographer Nan Goldin to raise awareness of the Sackler family, major art philanthropists who own Purdue Pharma, the manufacturer of Oxycontin) cried “direct action works,” before announcing that multiple museums, including Tate and the Guggenheim Museum in New York, had decided to stop taking funding from the Sackler family. 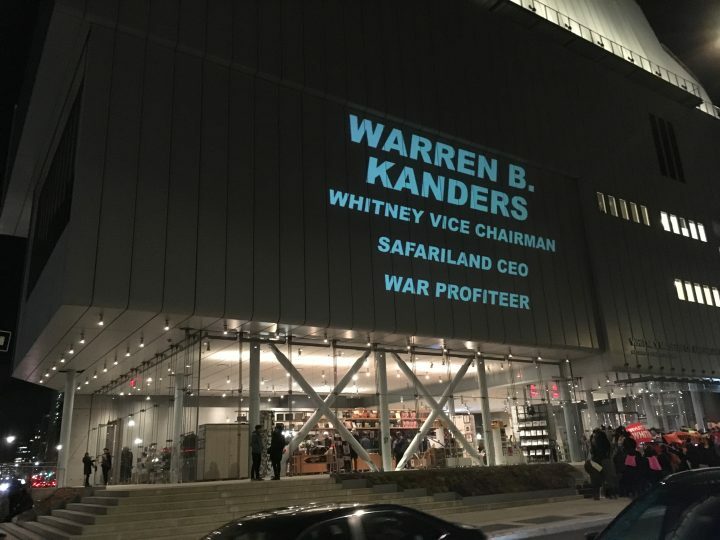 “What we’re doing is in solidarity with the workers who [started] this,” said one protester, referring to the near 100 staff members who signed a letter to Whitney Director Adam Weinberg, after learning that Kanders is the owner of Safariland. 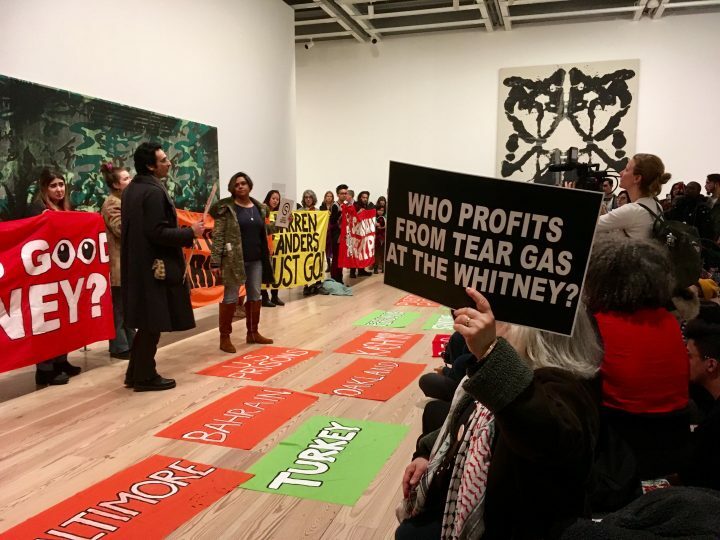 The last time Decolonize This Place held a protest at the Whitney, participants lit sage, meant to mimic tear gas, and its smoke wafted through the lobby until the fire department arrived. 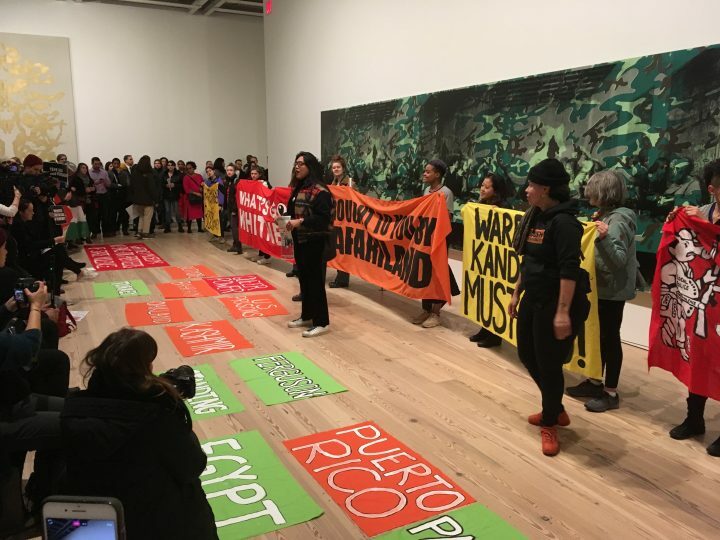 This time around, before protesters entered gallery spaces, unfurled banners, or started chants, they slowly distributed fliers to museum staff explaining why they were there, engaging them in conversation. 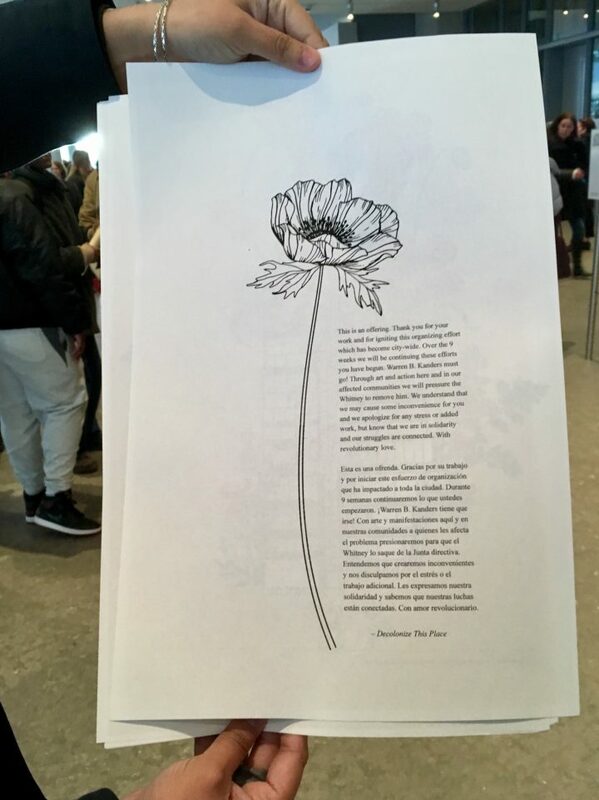 “We understand that we may cause some inconvenience for you and we apologize for any stress or added work, but know that we are in solidarity and our struggles are connected,” the fliers read. “Please don’t set anything on fire,” said one worker, recalling the sage burning ceremony in the last protest. One supervisor told the activists, “If we weren’t working, we’d be protesting with you.” Others expressed their support tacitly. 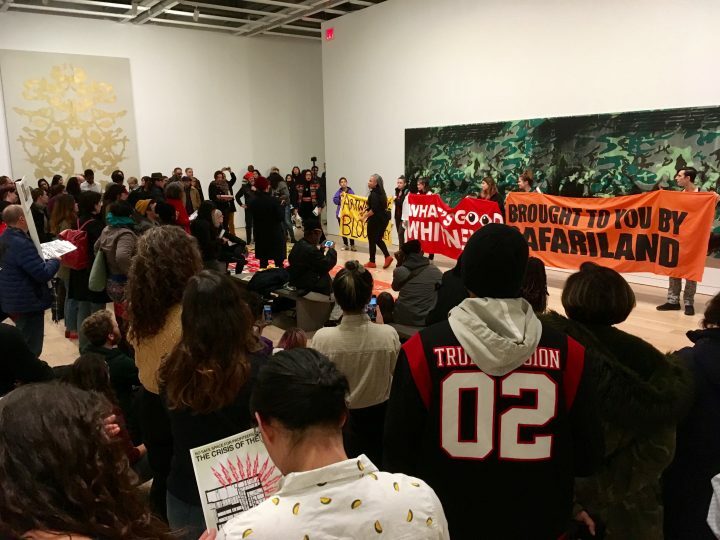 “We don’t want to make their lives more difficult than they already are,” Amin Husain, one of the founders of Decolonize This Place, told Hyperallergic, speaking of the museum staff. Marz Saffore, another DTP member, added that “One thing we noticed from out last action is we did end up putting extra work on the front of house staff,” who had to perform extensive crowd control and answer questions from confused patrons. 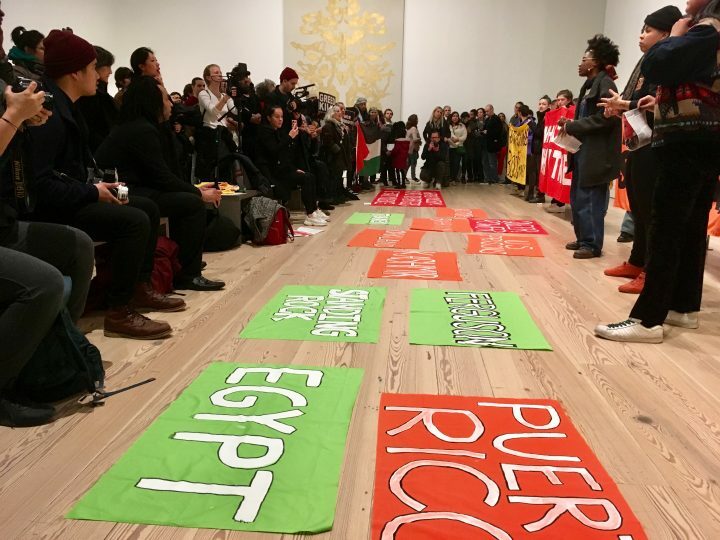 The protestors were also careful not to criticize artists who will participate in the 2019 Whitney Biennial. 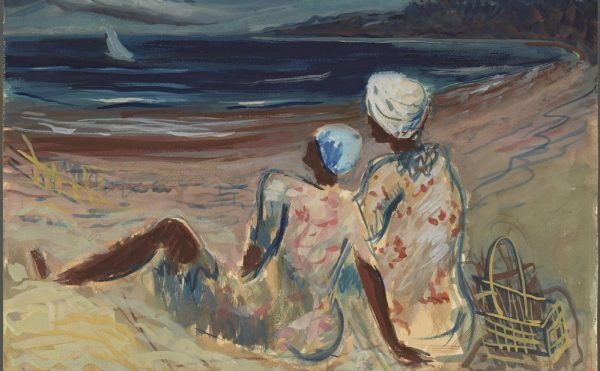 “Artists will respond to this as they see fit. 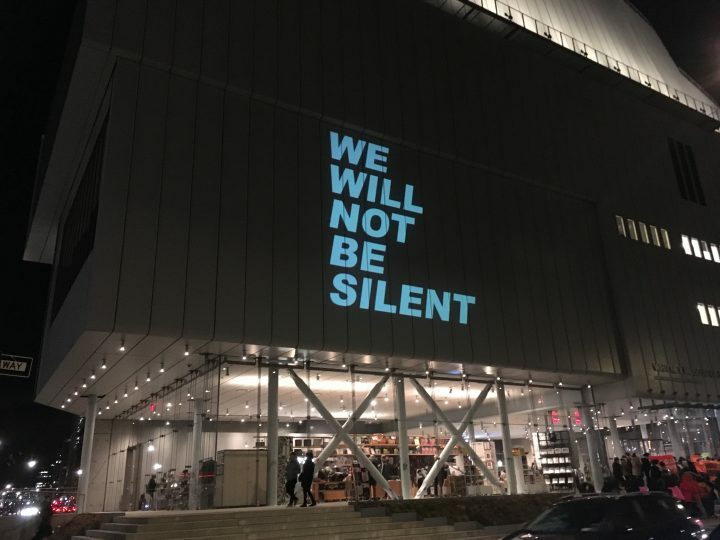 They have their own means of activism,” activist Dalaeja Foreman told Hyperallergic. 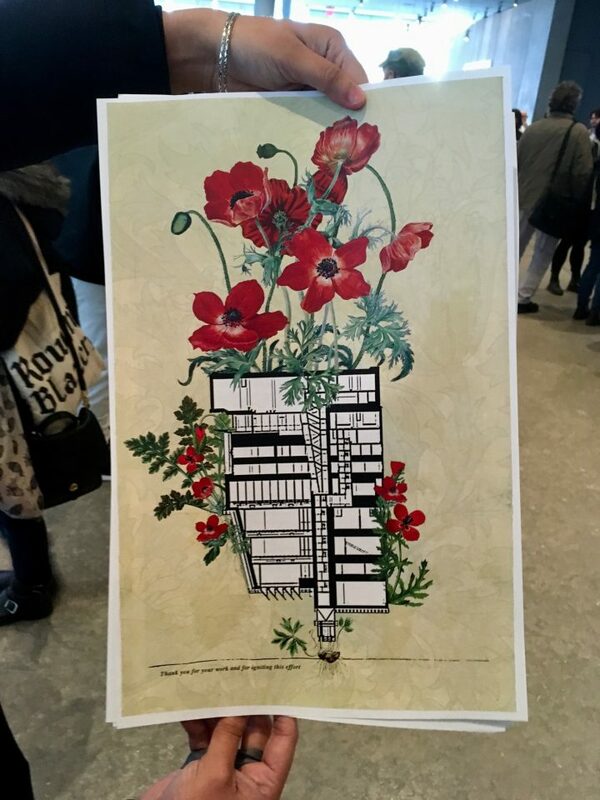 So far, only one artist (Michael Rakowitz) has withdrawn from the biennial. 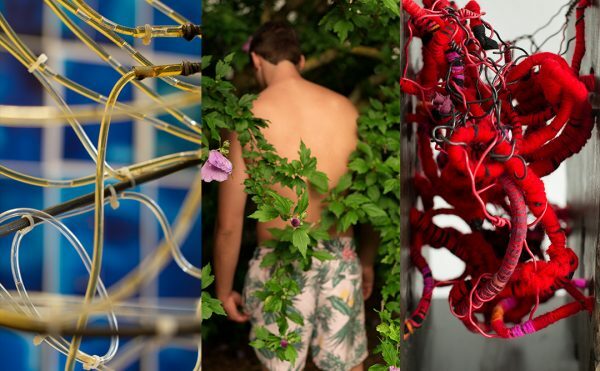 The art collective Forensic Architecture announced that it will respond to the crises through the work they will present at the biennial.